The Experimental Aircraft Association’s (EAA’s) fly-in airshow is held annually in Oshkosh, Wisconsin. This year, it was held from July 28 – August 3. It is one of the largest events of its kind, attracting over half a million aviation fans, among them, of course, CAP members. According to EAA, this year’s show may have been their biggest event to date. Our squadron did not have any official presence at Oshkosh. One member did report seeing CAP members working the flight line, to help keep the event safe for everyone. My favorite airplane is the Just Aircraft SuperSTOL, which has leading edge slats, big flaps, and a shock-absorbing landing gear. It practically lands on a helipad! It was operating off the ultralight runway, and I think it landed shorter than the parachute wing tricycles! It's a simple plane, so I really liked the Spartan panel layout as contrasted with the two ANR headsets hanging in the airplane for use by the pilots. The airshow! The Thunderbirds were in attendance. According to EAA, this was their first ever appearance at the show. 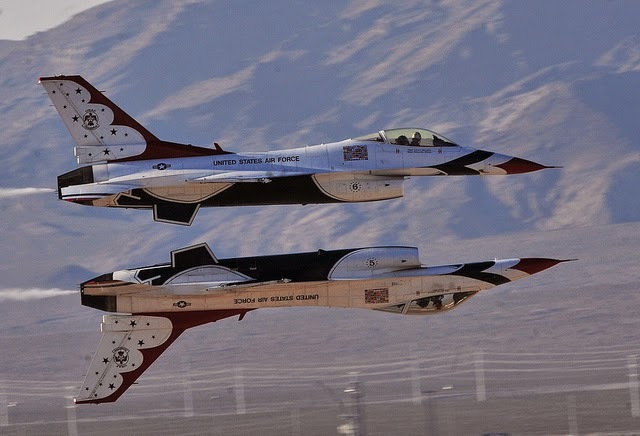 Many of the maneuvers they showed off were similar to what other air teams were doing, but to a vastly higher level of precision and conducted at much closer to the speed of sound. You can't quite believe that you're seeing planes screaming at 700 mph doing stuff like this! My thought on the air shows? I saw barrels of smoke oil being moved around the field. Just as Mark Twain said never to pick a fight with a man who buys ink by the barrel, I think pilots should say to avoid getting into an acrobatic contest when your opponents buy smoke oil by the barrel! The Geico Skytypers use WW2-era SNJ trainers, under computer control to essentially do a dot matrix printout of characters. They developed their own software, and yes, it does have a spell checker, but no autocorrect. Walking the parking area and talking to people who had built their own airplanes. This is so common at Oshkosh that if you want to know what a particular model is like, just ask. Most people are happy to talk about their airplanes. The amateur-built Rotorway helicopter kit. I don't know how I feel about it, but it's cool to see lightweight helicopters in addition to fixed-wing aircraft. Cessna announced that they will be offering a compression ignition powered C-172 to go along with the C-182. Diesel may be CAP’s future at some point, so it would be good to start learning about how they work (there are competing technologies at the moment). Garmin is really pushing their VIRB camera. We may start using one of the versions of this camera in our aerial photography. Boeing was a big sponsor this year. It seems they were marketing and recruiting for expected shortages of pilots etc. in the future. A good time to be young and have an interest in aviation! Being able to buy anything I wanted related to aviation. It was easy to try on any headset you'd want because most of the vendors had exhibit space (either tents outside or a booth inside one of the big hangars). I picked out a new flight bag as well as a headset. In the more esoteric products, you can purchase an oxygen mask and ear protection for your dog, both available from multiple sellers. I considered buying a DeLorme Inreach, which uses the Iridium satellite network to track your position. I know several pilots who use either a DeLorme or a Spot and who like flying with the extra peace of mind. Being able to handle a unit and ask questions of a rep helped me make a better purchase. 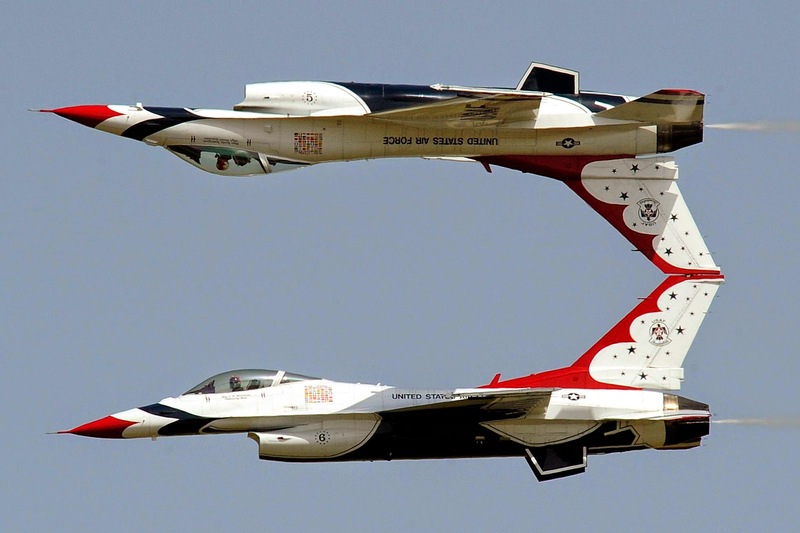 Also not from this year's Oshkosh but another performance by the Thunderbirds: "Tbirdscalypsopass" by Staff Sgt Richard Rose Jr, US Air Force. Overall, it’s total immersion in everything aviation. If you’ve never been, maybe next year is the time to check it out.